Bruce Lee 2 The Figher is a kollywood tamil movie released under the banner of DVV Entertainments DVV Danayya (Produced By) in the year of 2015. Star Casts are : Ram Charan, Rakul Preet Singh, Kriti Kharbanda, Brahmanandam, Arun Vijay, Sampath Raj, Nadhiya, Brahmaji, Rao Ramesh, Amitash Pradhan and Others. Write & Share about "Bruce Lee 2 The Figher Movie" ! 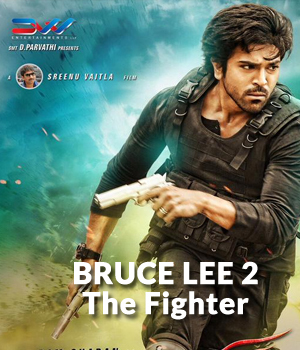 Bruce Lee 2 The Fighter | Tamil Movie | Teaser | Ram Charan | Rakul Preet | Thaman | Mango Music | Bruce Lee 2 The Figher Star casts are Ram Charan, Rakul Preet Singh, Kriti Kharbanda, Brahmanandam, Arun Vijay, Sampath Raj, Nadhiya, Brahmaji, Rao Ramesh, Amitash Pradhan and Others. We do not sell pirated Bruce Lee 2 The Figher DVDs & VCDs. We recommend you to buy movies of original DVD & VCD. We do not provide paid / free Bruce Lee 2 The Figher Movie downloads. We do not offer to watch Bruce Lee 2 The Figher movie online. Bruce Lee 2 The Figher Movie Review/Comments are added by registered customers via Facebook Comments. Bruce Lee 2 The Figher Movie Star Rating by unique customer filtered by IP's. Free wallpapers download of Bruce Lee 2 The Figher movie, hero, heroine, etc is available in our Gallery section. Bruce Lee 2 The Figher Wiki & Box office collections are updated regularly.